Lightweight, portable, powerful and convenient are key features to look for in the Best AAA flashlight. Owning one can provide you with reliable lighting under most conditions and for different purposes. The brightest AAA flashlight, however, isn’t easy to find. There are many of them on the market, so finding one can be overwhelming. Check out this guide for help in choosing the right AAA flashlight that you can always rely on for tactical purposes, camping and hiking, to name a few. SureFire Titan Plus makes it to this list because of its ultra compact and triple output feature. You can’t underestimate it even with its very tiny size because it is big time in output. It gives out twice the max lighting with its intelligent design. It has a reflector that shapes the light into a precise beam for an even dispersion, which is ideal for close range spotlight activities. For convenience, the flashlight comes with a removable pocket clip, providing you an easy carry option. The product also has a nickel-plated brass construction, making it durable. To adjust light output, all you need is to twist its head counterclockwise. So if you’re looking for a sturdy and portable flashlight, which is also weather resistant, go for this Titan! The best AAA keychain flashlight is a combo pack of MAGLITE XL200 that includes five lighting modes. The product also includes a motion control functionality that you can depend on under any conditions. You can easily adjust from bright to dim or vice versa on demand. The AAA flashlight is also intelligent to remember your last preference. The next time you turn the product on, it will give out the same lighting you last used. The best AAA tactical flashlight can also prevent any accidental activation for its Lock Out function. The product includes a silent signal mode to produce short and long flashes (Morse code signals) to control by just rotating its light. You can just push the button for switching any of the five functions on. Additionally, you can depend on its inertial switch that responds when you rotate it for output adjustment. Max beam distance is 138 m and lumens 173. The ProTac 1AAA is the best single AAA led flashlight for users who want a backup and compact light. The product is easy to carry in your pack, belt or pocket. It also has powerful, reliable light whenever you need it. The flashlight boasts its Ten-Tap programming options, along with three operating modes to choose from and use. You can select from high only, high or strobe or low, or low or high. This is the best AAA battery for flashlight if you are also looking for single-battery flashlights. It can be powered by an AAA (lithium or alkaline) battery. It uses the latest LED technology that makes its one of the brightest flashlight on the market. The product also comes impressive for being a RoHS compliant and IPX7 waterproof flashlight that can be submerged in water for 30 minutes for up to one meter. How to choose best AAA flashlight? Choosing the best budget AAA flashlight should be easy. The best place to start is the list above. It highlights three of the best flashlights on the market. Each is unique to their function and power. But still, they are all ideal for any purpose and reliable lighting you need on demand. Select based on your budget, features and lighting output provided. What is the best AAA flashlight? There is no definite answer to this question. Still, the three best products have been researched and reviewed for you. The only thing left is to choose which one can provide you with the powerful lighting you need when you want it. What is the brightest AAA flashlight? Three of the brightest on the market are listed above. They are from well-known flashlight brands, so selecting one based on brightness would be easy. Check them out and see how much lighting power you need and what among the three can supply it to you. What is the best single-AAA light with a tail clicky? There are many products to choose from in terms of having a tail clicky. From the products reviewed today, one that stands out, at least in terms of being a single-battery option product, is the ProTac 1AAA. You may want to consider it if you’re looking for maximum output throughout the battery’s life as well. Who makes the best AAA Flashlight? Streamlight, Maglite and SureFire Titan are three of the most reliable and trusted brands in the industry. You can choose from these flashlight makers to get the most out of your spending while maximizing your investment with powerful outputs and durable construction. How to install AAA batteries in a flashlight? All you need is to follow the best small AAA flashlight diagram, which is usually inside the battery chamber. You can check it to know how to position the batteries in your flashlight. The best AAA batteries are reliable, powerful, compact and easy to carry. All these made it to this list due to their latest LED technology, durable construction, precise beam, multiple lighting adjustments and smart functions. 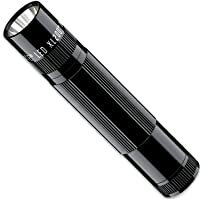 One is the SureFire Titan Plus Ultra-Compact AAA Flashlight for its high performance LED lighting and beam reflector. You also have the Maglite XL200 LED 3-Cell AAA Flashlight that is smart for its motion control functionality and SOS signaling function for emergencies. Finally, you have the Streamlight 88049 ProTac 1AAA Flashlight to choose for its Ten-Tap programming options and three operating modes. Select the best AAA flashlight today! Beside that, at my blog, we also have many articles to share you all things need to know about flashlight, and the next topic is Best 18650 Battery for Flashlight.